The group, calling themselves “The Losers Club”, learn that they are each being terrorized by the same entity a predatory shapeshifter which has the ability to transform itself into its prey’s worst fears, allowing it to exploit the phobias of its victims. 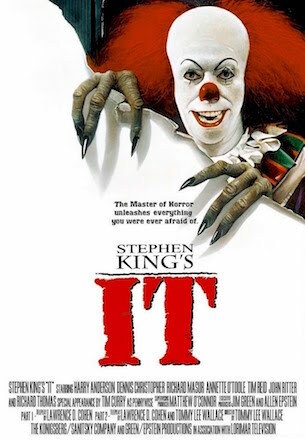 It mostly takes the form of a sadistic, wisecracking clown called Pennywise played by Tim Curry. They learn that Pennywise appears every few years and is linked to a series of unsolved tragedies which have been happening in Derry for centuries. So they decide to kill IT. So the Losers venture into the sewers under Derry to kill It, hotly pursued by Henry and his friends, Victor Criss and Belch Huggins, who are intent on killing them. They encounter IT in an exciting encounter where IT manages to clobber some of them. Henry Bowers meanwhile sees The Deadlights, and loses his mind in the encounter. He is later institutionalized in Juniper Hill Psychiatric Asylum after taking credit for all the murders. Meanwhile Pennywise/IT escapes. So Bill and the others promise to return and kill IT should the creature resurface 30 years later. Thirty years later In 1990, now the town librarian, Mike is investigating the string of missing children and killings and arrives at the crime scene of a murdered girl named Laurie Anne Winterbarger. Finding Georgie’s picture convinces Mike that IT is back as he proceeds to contact the others to fulfill their vow. Bill became a horror novelist married to British actress Audra Phillips, Ben is an architect, Beverly is a fashion designer abused by her husband Tom Rogan, Richie is a late night TV comedian, Eddie runs a limousine service but still lives with his mother, and Stan is a real estate broker. After being contacted Stan tragically commits suicide in his bathtub and writes “IT” on the wall in his own blood. I also enjoy reading exciting historical fiction by authors such as C.j.Sansom, Conn Iggulden, Robert Harris, Hilary Mantel and Ken Follett. So i would like to read Swordland. This is the debut novel by Ruadh Butler and book one in The Invader Series. It is an exciting tale of war, death, lust, and scheming, set in the starkly beautiful landscapes of medieval Celtic Ireland and Wales. Then the deposed King Diarmait Murchada arrives, he is the ambitious overlord of an Irish kingdom who was Forced to flee by the High King of Ireland, he seeks to reclaim his lands by any means possible, and that includes inviting the Normans in. With nothing left to lose and perhaps a great deal to gain – FitzStephen agrees to lead the Irishman’s armies, and to drive Diarmait’s enemies from his kingdom. His price? Acceptance, perhaps or maybe even a kingdom of his own. Book Two of the Invader series “lord of the Sea Castle” is also available. I would like to read Breakout, an Exciting fast paced science-fictions story by Monique Mondesir. It is book one in the Space Outlaw series of novels. It features Phoenix Jones who finds himself being Locked away with the scum of the galaxy after being imprisoned for a crime he didn’t commit and shipped lightyears away from family that need him the most, he is Looking for a major payoff to save his brother and sister, he needs money and fast. Now locked away in a prison on the planet Dredar with the vilest and most dangerous criminals in the galaxy, hope looks bleak. He needs help and he needs it fast. Then he meets the most feared bounty hunter in the galaxy, a crazed scientist, a plucky engineer and a backstabbing thief who are all plotting to escape. However is he willing to risk his life and can he rely on them to get the job done? Another short fantasy/science fiction book I would like to read is “He who fights” by Mike MorriS which is available Free gratis with Amazon Kindle Unlimited. It is an exciting fantasy adventure that features a chap named Nathaniel Rane. He is a soldier in the Fabled Legion of Swords. The Legion of Swords find themselves confronted by A fearsome Demon Army. So Faced with the prospect of defeat Nathaniel Rane and his fellow soldiers in the fabled Legion Of Swords resort to using outlawed magic to fuse their souls with their blades. This make them Faster, stronger and all but impossible to kill, and they manage to turn the tide of the war and emerge victorious. However the magic has a terrible price, Two years after the end of the war, the magic that once saved them is now turning the Legionnaires into monsters far worse than anything the world has seen before. Now pursued by bounty hunters and foul creatures from the underworld, Rane must find a cure before he loses the battle for his soul. I would also like to read The Cosmic Bullet by Andrew C.Broderick. The Cosmic Bullet is part one of a gripping science-fiction adventure series. It features two brothers on different ships who on Finding a huge one-mile-long alien object has entered our solar system, Christen it “The Enigma”, and fly out to investigate. One brother, Drew Kovacs, is a scientist and intends to examine it scientifically and to find out where it came from and uncover its secrets, hoping this will make him world famous. Meanwhile his brother, Storm, is the owner of a space salvage company, and intends to salvage it, strip the artifact’s immense titanium exterior and sell it for scrap, in order to make him rich And secure his daughter’s future. Meanwhile the Russians also intend to plunder the enigma for its alien technologies, and they have the weapons to fend off both brothers. However the Cosmic Bullet is made of self aware material and contains a deadly payload and people are so preoccupied with their own intentions that nobody has even considered the alien race who actually built the Enigma, and to whom it actually belongs, and they may be much closer than anybody realises and could pose a serious threat to the human race. Sister, Psychopath is a gripping psychological Tale of sibling rivalry and dysfunctional relationships,by best-selling author Maggie James which is available Free gratis with Amazon Kindle Unlimited. Sister, Psychopath tells the story Of two sisters Chloe and Megan. When they were children, Megan adored her younger sister Chloe. Now she can’t bear to be in the same room as her. Megan believes Chloe to be a psychopath and her sister does appear to be a textbook case: cold, cruel, lacking in empathy, selfish who will do anything to get what she wants. Having read both War of the Worlds by H.G.Wells and The Massacre of Mankind by Stephen Baxter, I would like to read The Final Enemy by Dan Petrosini. This fast-paced, gripping, suspenseful and exciting science fiction thriller features a newly graduated reporter named Jack Amato, who is writing obituaries and Pet stories for a daily newspaper called “the Iowan” in Keokuk, Iowa, while waiting for the scoop that will lead to fame and fortune. Jack is frustrated and longs for a breaking story. As his frustration mounts, He suddenly realises that no one has died in over three days. Then a meteorite crash lands near his home. So Jack requests an assignment to report on the asteroid. Jack’s in a position to not just report the news, but change it, so Seizing the opportunity, Jack writes a far-fetched story connecting the meteorite to the lack of deaths in the area. However he discovers that the curious phenomenon does in fact follow along the route the asteroid took. So Jack investigate whethers it is just coincidence or something more sinister. American author, poet, editor and literary critic Edgar Allan Poe sadly passed away On October 7, 1849, at the age 40 in Baltimore; the cause of his death is unknown and has been variously attributed to alcohol, brain congestion, cholera, drugs, heart disease, rabies, suicide, tuberculosis, and other causes. He was born January 19, 1809 in Boston, Massachusetts. He was orphaned young when his mother died shortly after his father abandoned the family & was taken in by John and Frances Allan, of Richmond, Virginia, but they never formally adopted him. He attended the University of Virginia for one semester but left due to lack of money. After enlisting in the Army and later failing as an officer’s cadet at West Point, Poe parted ways with the Allans’. His publishing career began humbly, with an anonymous collection of poems, Tamerlane and Other Poems (1827), credited only to “a Bostonian”. Poe switched his focus to prose and spent the next several years working for literary journals and periodicals, becoming known for his own style of literary criticism. His work forced him to move among several cities, including Baltimore, Philadelphia, and New York City. In Baltimore in 1835, he married Virginia Clemm, his 13-year-old cousin. In January 1845 Poe published his poem, “The Raven”, which tells of a talking raven’s mysterious visit to a distraught lover, who is lamenting the loss of his love, Lenore and it traces the man’s slow descent into madness. The poem has a supernatural atmosphere and also makes use of a number of folk and classical references and became a huge success. Poe claimed to have written the poem very logically and methodically, intending to create a poem that would appeal to both critical and popular tastes, as he explained in his 1846 follow-up essay “The Philosophy of Composition”. The poem was inspired in part by a talking raven in the novel Barnaby Rudge: A Tale of the Riots of ‘Eighty by Charles Dickens. Its publication made Poe widely popular in his lifetime, although it did not bring him much financial success. Soon reprinted, parodied, and illustrated, critical opinion is divided as to the poem’s status, but it nevertheless remains one of the most famous poems ever written. He also began writing his own journal, The Penn (later renamed The Stylus).